Benedict House opened April 28, 2006, and is the only facility for homeless men in Kitsap County. 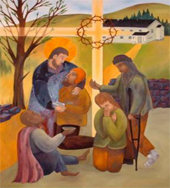 The program is named for St. Benedict Labre (shown in the painting to the right), patron saint of homeless persons. Benedict House provides emergency beds for 24 single homeless men who are currently homeless in Kitsap County. The shelter also provides 3 additional respite beds for those needing time to recover after medical treatment. Men interested in staying at Benedict House must apply through the Housing Solutions Center at 1201 Park Avenue, Bremerton, (360) 473-2035. For more information about HSC, click here. Benedict House staff utilizes a team approach when providing support for its residents. Meals – Volunteers from surrounding churches prepare the evening meal which is served in the commons dining room that also serves as a multi-purpose room for meetings and activities. Housing – Clean and sober living arrangements are provided in a physically and emotionally safe dormitory-style environment. All sheets, towels and toiletries are provided, including shower and restroom facilities. Locked storage is available. For more information about services, volunteer opportunities or needed donations, please call (360) 377-6136.